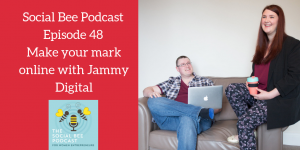 This week on the podcast, I talked to Martin Huntbach and Lindsay Cambridge of Jammy Digital. Martin and Lindsay have been building websites for entrepreneurs since 2012. They have an excellent free Facebook group, Website Tips for Non Techies, and regularly run webinars and website reviews online. We talk about how to improve your website, some SEO tips, and the upcoming Make Your Mark Online Membership.